Apple seems quite chuffed with the launch of its Safari 4 browser, quoting 11 million downloads in its first three days. Over half of those (6 million) were downloaded to Windows machines. 0.1% boost = incredible success? "Safari 4 is an incredible success on Mac and Windows," said Philip Schiller, Apple's senior vice president of Worldwide Product Marketing. 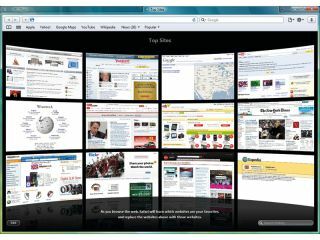 "Safari users love the incredible speed and innovative features like Top Sites, Full History Search and Cover Flow." However, Global Stats Counter shows just the tiniest uptick in actual Safari browser usage, from 2.82% of all users at the start of June to 2.92% yesterday.